A true hero who initially had no special powers except for his infinite perseverance, pure heart, and quick wit. This man toiled and toiled for many months and years just to be able to be on the same playing field as the other naturally gifted heroes of UA Hero Academy. Truly, the definition of succeeding and growing exponentially against all odds, this hero is none other than Izuku Midoriya AKA Deku, the inheritor of “One for All” and disciple of All Might! Deku comes to you in FUNKO POP style. 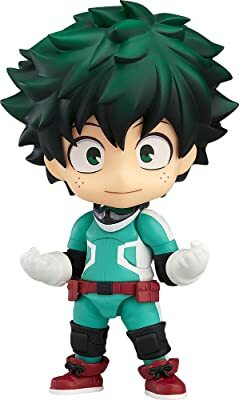 Crafted from vinyl, this 3 and ¾-inch figure showcases Midoriya’s signature green hair, freckled face, red boots and of course his green track-suit costume which was made from scratch by his own mother. Grab this Deku Funko Pop figure now and forever commemorate Deku’s tear-jerking, awe-inspiring journey! The proverbial symbol of hope who, in a matter of decades, tore down the major criminal organizations such as the Yakuza and All for One’s group and ushered in a long era of relative peace. He is the number 1 hero in the whole world and the teacher of Deku. This hero is none other than ALL MIGHT! Crafted from vinyl this 5-inch figure comes to you in Funko Pop style. 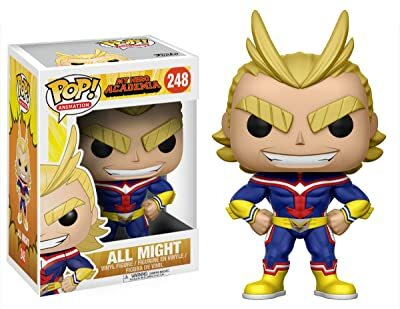 This figure showcases All Might’s signature blond hair shaped into 2 rabbit-like ears or “ahoge” (literally “foolish hair”), his bushy eyebrows, blue red and gold muscle suit and of course, his foolish yet inspiring pearly smile. Don’t miss out on perhaps the greatest hero to ever live in the My Hero Academia (MHA) universe, who despite all his power, remained a fun-loving and genuine person! His appearance and personality don’t suit the typical snarky, quick-witted and smart-mouthed tropes that usually possess his super speed quirk. He is the president of UA Class 1-A, who is always neat, well-mannered and obedient to the rules-Iida Tenya! Crafted from vinyl, this 3 and ¾-inch figure comes to you in Funko Pop style. With his adorably large head, cute glasses and neatly styled hair, Iida Tenya appears both cool and cute. This figure showcases Iida’s classic hero costume: blue, white and silver colored armor with multiple mechanical accents. The costume focuses on Iida’s legs, particularly his calves and thighs which are the source of his super speed. The leg armor sports shin and knee guards and even includes exhaust pipes for Iida’s “leg engine” to smoothly fit. 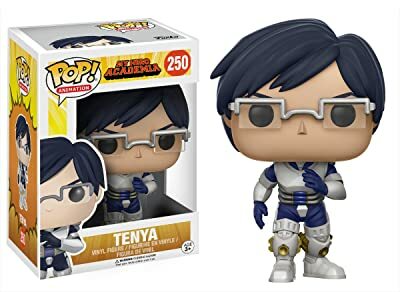 Funko Pop Iida is definitely a cool addition to your MHA collection. Don’t let looks fool you! This seemingly cute, harmless and ever adorable girl is none other Ochako Uraraka, the gravity-wielding hero of MHA. One of the first few friends of Deku, she initially joins UA in order to land a high-paying job to support her parents who work as construction workers. After meeting Deku, Iida and Bakugo however, she becomes more resolved to become a hero to protect others and is able to unlock more from her powerful gravity quirk. 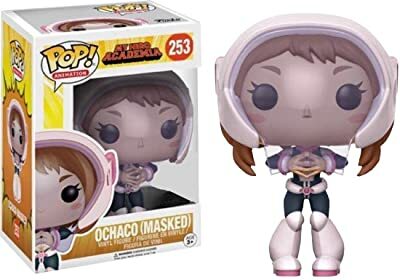 Crafted from vinyl, this 3 and ¾-inch Funko Pop Ochako figure sports her signature black and pink astronaut-style hero costume, her chubby cheeks and her adorably large eyes. 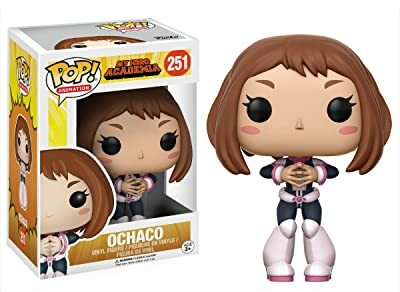 Hurry now and collect Ochako Uraraka AKA Uravity! This staple character will no doubt be a potentially powerful hero of the MHA franchise. It’s everyone’s favorite, all too relatable character, Izuku Midoriya once again. 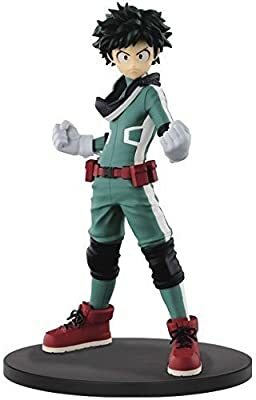 Sporting a look that more closely resembles the features of the anime and manga version of Midoriya, this figure showcases Izuku’s messy green hair, determined eyes, red boots and utility belt, and finally his signature green tracksuit, including his black face mask. Created by Banpresto and standing at roughly 5.9 inches, Midoriya looks even more formidable in this version as he stands in his “guts” pose. What are you waiting for? 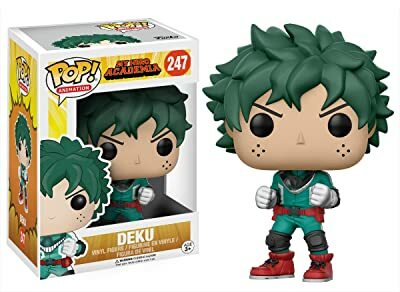 Grab this collectible now and complete your Izuku Midoriya MHA collection. Blasting straight through your screen with his explosive sweat (nitroglycerin), is the fiery, hot-tempered and talented student of the class of 1-A whose foul-mouth, nasty personality and seeming disdain for the weak make him appear more villain than hero. This man is none other than Katsuki Bakugo, Deku’s childhood friend, or should we say, tormentor, who throughout the series begins to acknowledge Deku as a true rival. 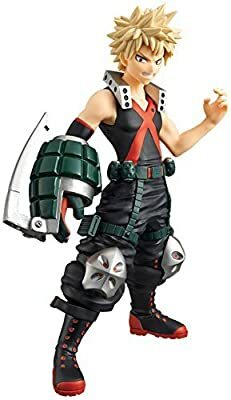 This Banpresto designed 5.9-inch figure depicts a cooler looking Bakugo, yet still retains his signature messy dirty-blond hair, grenade-shaped arm gauntlets as well as his black, red and green guerilla soldier-style costume. And if you thought his hot temper and explosion-enhancing grenade-gauntlets did not provide enough action, fret not as Bakugo also has a set of normal-sized grenades on his belt made from his explosive sweat. Buy Banpresto Bakugo now and complete your Katsuki Bakuguo MHA Collection! 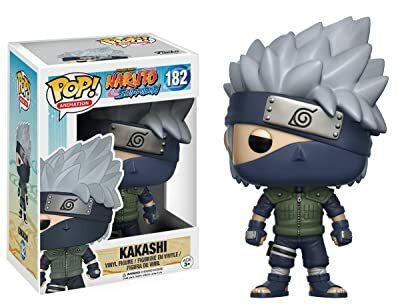 A long-standing rival or should we say “tormentor” of Deku, Katsuki Bakugo comes to you in Funko Pop style! With his large eyes and head, detailed hair-design and largely expressionless face, Bakugo actually looks cute! 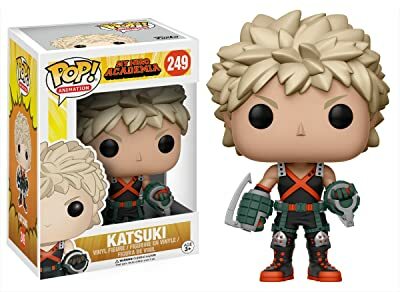 Standing at 3 and ¾ inches, this vinyl figure showcases Bakugo’s hero-costume: a sleeveless black tank top, fitting for Bakugo’s messy and erratic fighting style, black combat pants with knee guards, high-cut combat boots and his signature grenade style arm gauntlets, which can store his explosive sweat for an even more devastating attack. This figure is a perfect mix of cool and cute and is one of the more unique depictions of Bakugo. Start your Bakugo collection with this figure now! It’s our green, freckled hero Izuku Midoriya (again)! Retaining all his previous features and signature qualities, what sets this Nendoroid figure out is its versatility. The Nendoroid Izuku Midoriya figure comes with a translucent base with various support materials for different poses. The figure comes with 3 different faceplates depicting calm, crying and determined or angry Midoriya. It also comes with a “SMASH” text plate which can be attached to the figure and used for poses and scenes. You can also replace Midoriya’s hands to depict different attack poses such as one finger or whole fist One for All SMASH! This piece will not only be a perfect addition to your Deku collection but will also be very fun to play with, allowing for a wide range of poses and stances. What are you waiting for? Grab it now! Who could this caped green hero be? Wait, that tracksuit… those freckles and green hair, it’s Deku! 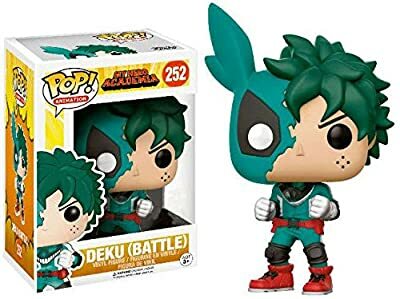 Izuku Midoriya AKA Deku appears to your screen in battle mode with his green bunny-like mask, a tribute to his favorite hero of all time All Might, torn on one side. Clenching his fists and bracing his legs, Deku is ready to strike, or should I say smash, down all those who wreak havoc and prey on the weak. This Battle Mode Deku in Funko Pop style is a generous treat for MHA fans. The figure retains Deku’s cuteness and signature features, but at the same time, presents to us an older more determined and more formidable Deku with his scrunched eyebrows, fighting stance and his hero-mask. Your Deku collection won’t be complete without this piece! Purchase it now while stocks last! Leaping at your screen with his newfound ability full-cowl, Izuku Midoriya AKA Deku arrives to save the day once more. This Deku figure is made of figma joints which are smooth and easy to use to set-up different poses. The plastics itself which makes up the figure is flexible in important areas, maintaining important proportions and dimensions, whilst allowing high possibility or a wide range of poses. The figure also comes with three faceplates depicting a gentle smile, a determined expression for combat scenes, and a flustered nervous expression for Deku’s normal self. An articulated Figma stand is included as well offering the possibility for numerous different poses and scenes. This piece is a must buy for collectors that love to play with, experiment or take stop-motion pictures of their figurines. Get it while stocks last! It’s your hot-tempered hero with a nasty personality Katsuki Bakugo, this time in Nendoroid style! 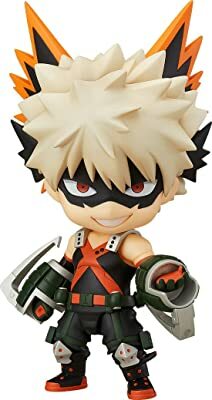 The Nendoroid version of this figure features flexible joints and multiple faceplates showing a masked Bakugo grinning ear to ear like a wolf, a maniacally laughing masked Bakugo and an unmasked sullen Bakugo. The figure also comes with an articulated transparent stand and support material as well as a “BOOM” text for a wide variety of poses and scenes. Collect both this Bakugo and Midoriya Nendoroid figures for even more poses and scenes. Heck, you might as well make a stop-motion film of the two figures fighting. What’s keeping ya? Get this unique and versatile Bakugo piece now! It’s the ever lovable Ochako Uraraka again, this time in fight-mode as Uravity! This figure is a 2017 Funimation San Diego Comic Convention exclusive item. Featuring Uravity’s signature features and costume design, this battle mode edition also sports Uravity’s pink astronaut-like helmet. In this edition, Uravity is depicted as pressing her fingers together in a braced stance, signaling the activation of her gravity quirk. Evildoers and heavy objects beware! Grab this unique and exclusive Uravity figure while stocks are still available! What are you waiting for? Can’t decide which character from the MHA franchise you should buy a figurine of? Perhaps you have decided but there are just too many different kinds of figurines for the same character? Ease your worries and grab 4 of MHA’s main characters. 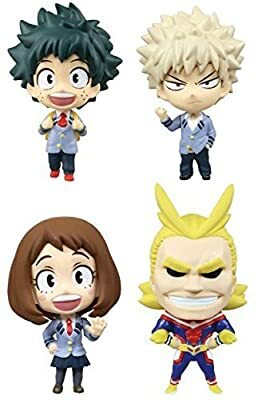 This complete 4-in-1 set contains Izuku, Ochako, and Bakugo in their UA school attire with their standard facial expressions. The set also includes All Might in his blue, red and gold hero costume. Purchase this set and start collecting, posing or reenacting iconic MHA scenes with these figurines now! What DJI Drone Should i Buy? Have you tried to google for your answer, and end up incredibly frustrated with the many sites, that generate gibberish with little to no value added. My goal is to recommend only the best product and to provide the best reviews to help you to make the best decision.